The weekend started off well with Cameron improving in time and with the setup of his FAB-Racing/Nova Racing Honda NSF250R, with Cameron finishing the session in 20th place and fifth fastest standard class man. 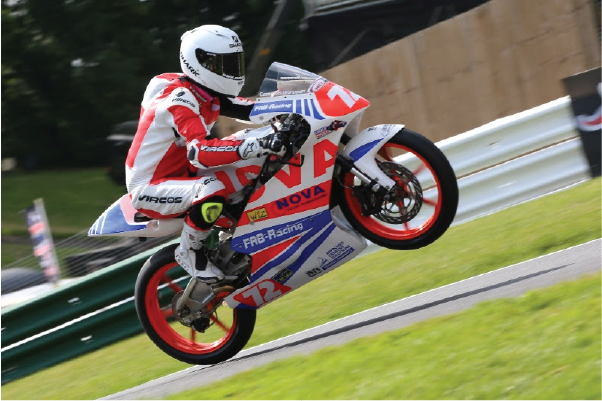 The Lewisham teenager improved vastly in time in qualifying, knocking off more than three seconds off his time to line him in fifth place of the standard class grid with a time of 1:38.092, which would be spilt up from the Moto3GP riders, due to the nature of the Cadwell Park circuit. Race one saw Cameron make a great start and he began to battle with the leading riders in the Standard class race, battling for a podium position. As they reeled in the Moto3GP class riders, who set off 30 seconds ahead of them, Cameron just couldn’t make his way past to continue the battle for the podium, crossing the line in sixth place in the standard class and 24th overall. For the second race on Bank Holiday Monday, Cameron started from fourth on the Standard class grid, and made a great start once again and looked to move his way forward into a podium position. As he chased the group ahead down heading into the mountain chicane on the second lap, Cameron lost the front end as he braked into the corner and crashed out the race. After the weekend Cameron said: “I’m really disappointed with this weekend, it’s been really tough to be honest. The last few rounds have been a test for us as a team and we have to get back on the podium at Oulton Park next time out. “I want to thank my family, FAB-Racing and Nova Racing for all their support, and I’ll be back pushing hard at Oulton. Cameron now sits in seventh place of the Hel Performance Standard Moto3 Championship on 157 points. The Championship now moves onto round nine in two weeks time at Oulton Park on the 9th/10th/11th September. The free practice session on Friday morning would see Cameron would hard on the setup of his FAB-Racing/Nova Racing Honda NSF250R, posting a time good enough to put him 18th, the sixth fastest standard class man. Friday afternoon would see Cameron improve in time by 1.3 seconds and leap three places upto 15th, and the second fastest standard class man in Q1, only one second behind Dan Jones the leader of the standard class. Q2 on Saturday morning would see Cameron drop down the standings after struggling to post a faster time, however he would stay in the top three of the standard class, starting from 19th on the grid, and third standard class man. From the lights in race one Cameron made a great start and ran with the leaders of the standard class. After Dan Jones pulled away from the group including Horsman, the battle was on for second place. He worked hard all race long, but just lost out in the dice for the podium after losing out to Mark Clayton in the final laps of the race, crossing the line in 18th place, and fourth standard class rider. 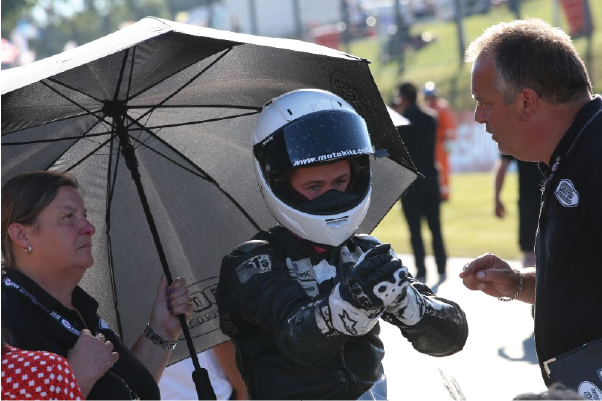 Race two on Saturday afternoon would see Cameron and the rest of the standard class share the circuit with the Moriwaki Junior 250 cup, as the rescheduled race from the first round at Silverstone. Cameron, starting from third on the grid, got off to a great start and battled for the lead of the race in a group of five riders. The teenager jostled for position with Asher Durham, Mark Clayton, TJ Toms and Liam Delves for third place just losing out on the line taking seventh place in the race. Come Sunday Cameron was confident of achieving a good result, and desperate to take to the podium at his home race. From the start Horsman made a great leap and battled hard for third place with Thomas Strudwick, Mark Clayton and Asher Durham. However, towards to the end of the race Horsman lost grip with his rear tyre, meaning he couldn’t push as hard as he wanted too crossing the line as the sixth standard class man, and 20th overall. After the weekend a disappointed Horsman said: “This weekend has been really frustrating, I wanted to try and take advantage of the three races we had to claw some points back in the Championship but for one reason or another it hasn’t happened. I have a small break now before the next round of the season at Cadwell and I will come back fighting. Cameron stays in fifth place of the Hel Performance Standard Motostar Championship sitting on 147 points. The next round of the Championship is run over the Bank Holiday weekend at Cadwell Park on the 27th/28/29th August.